Today, tea and rubber plantations straddle its rolling hills and golden rice paddies carpet the valleys as the precious gems of the land herald good fortune. Yet, fascinating tales of rich history and cultural heritage resonate beneath the quaint façade of Kuruwita. As the morning light bathed the town with a golden glow, we set forth on our journey to discover the hidden tales and mysteries of Kuruwita. 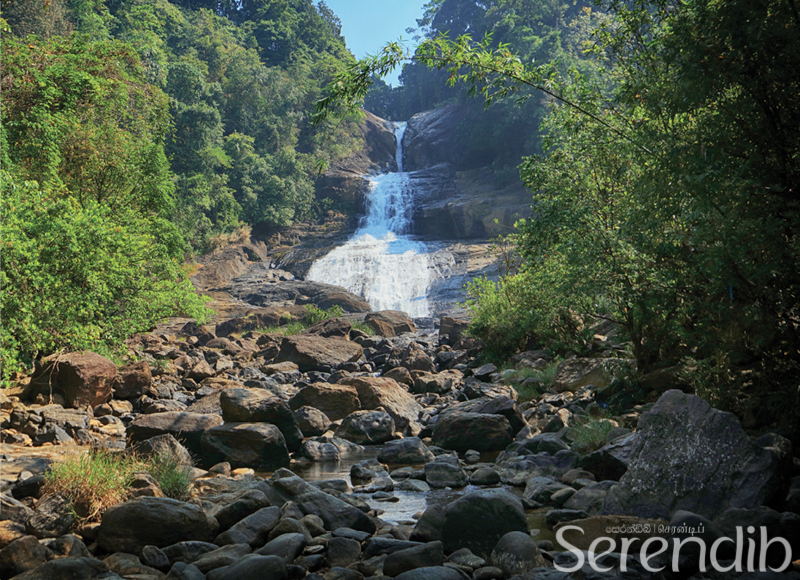 Traversing through the little town, we let our minds drift through the tides of time as the surrounding dreamy Sabaragamuwa hills enthralled us. 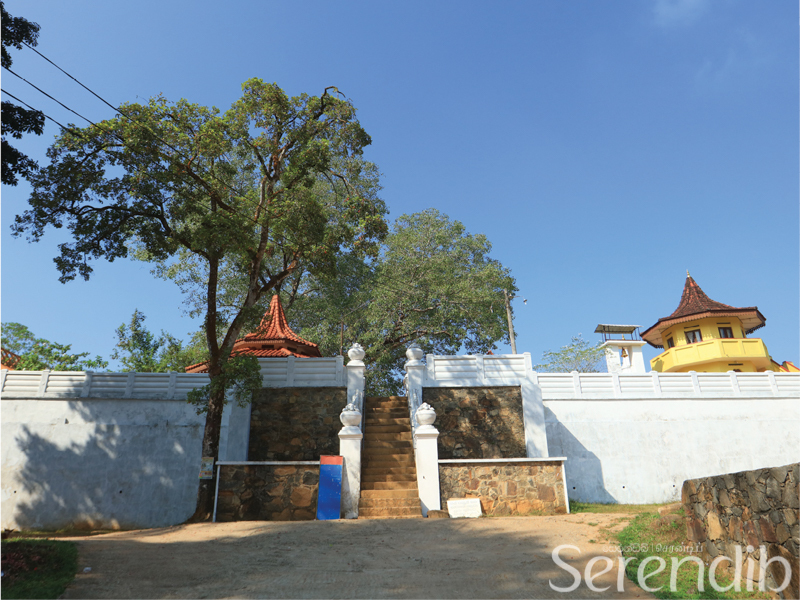 Situated a short distance away from the Kuruwita town is the historic temple of Delgamuwa Raja Maha Viharaya, which traces its history back to the times of the Portuguese. As the Portuguese strategically seized control of the coasts of the island in 1505, they needed to establish themselves in the country. The attempt of the Portuguese to spread Christianity resulted in the baptism of Prince Dharmapala, the grandson of King Buwanekabahu VII of Kotte and heir to the throne. Since the sacred relic or Dalada Vahanse was the undisputed sign of leadership in the island, Buddhist monks secretly transferred the sacred tooth relic to the Kingdom of Seethawaka, which was ruled by King Mayadunne. The sacred relic was concealed inside a grinding stone or kurahan gala at the Delgamuwa Raja Maha Viharaya until King Vimaladhramasuriya I placed it in the Vedasitina Maligawa at the Sri Dalada Maligawa in Kandy. 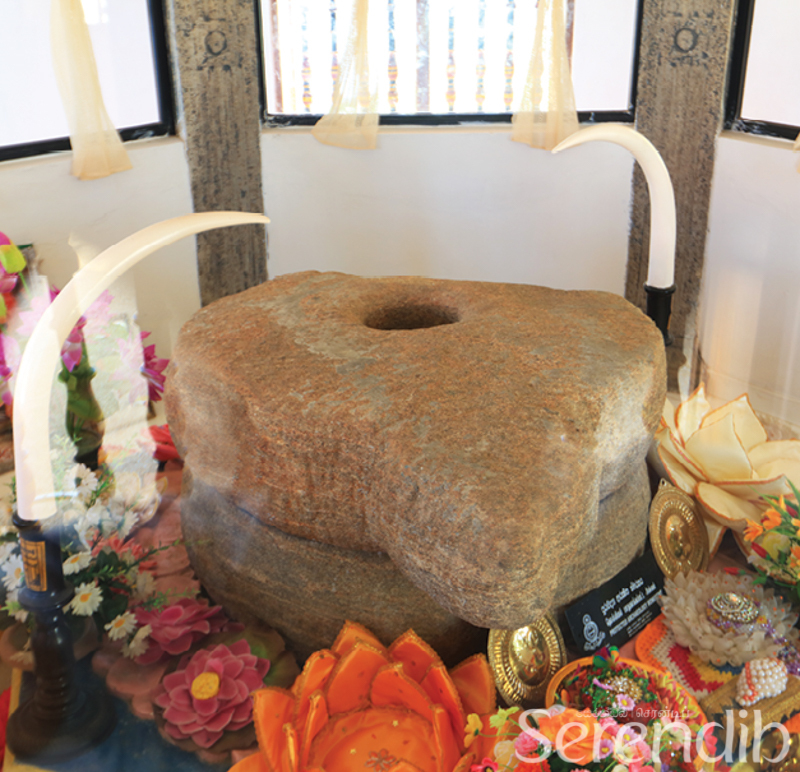 Today, the ancient grinding stone remains sanctified and revered at the Delgamuwa Raja Maha Viharaya. 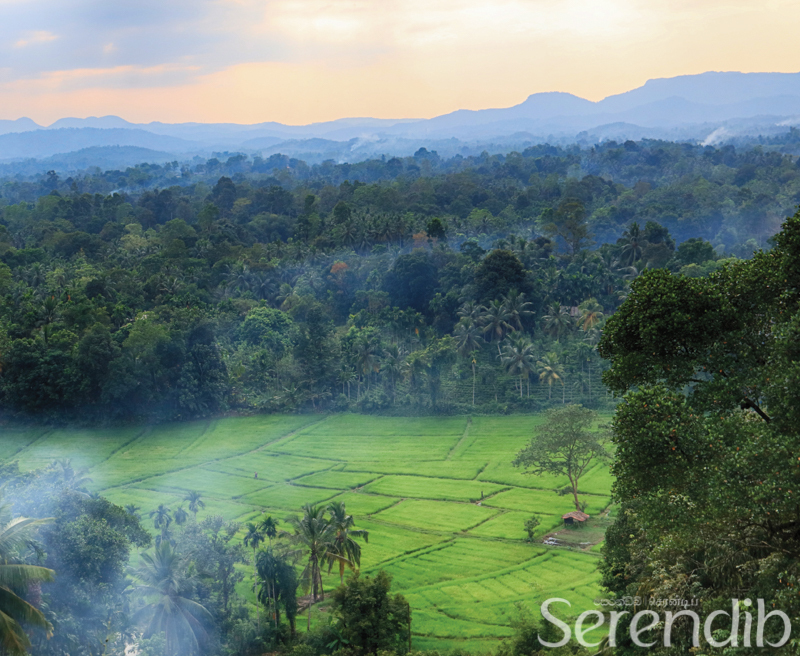 Sprawling tea plantations and lush foliage flagged the sides of the narrow road as we drove along winding slopes in search of the beauty of Kuruwita. Bopath Ella falls at 30m, and its name is derived from its shape as a Bo leaf. Beyond the quiet pulse of the town and roads, the falls mark a mysterious presence as it cascades down in perfect harmony with the rustling breeze. The stream is narrow at the beginning and flows through a flat plane before cascading into a gushing misty descent. The Bopath Ella falls comes to life during the month of May when the area experiences a heavy rainfall. The waterfall flows down rhythmically and joins the Kuru Ganga. The Bopath ella falls comes to life during the month of May when the area experiences a heavy rainfall. Back in the town we resumed our search for another historic destination; the abode of Sri Lanka's pre-historic man. We journeyed along Kuruwita Erathna road and turned on to Guruluwana road, and caught a glimpse of a signboard in a rubber estate. The climb to the prehistoric cave of Batadomba begins through a thriving rubber estate and the track gradually dwindled as we trekked into the jungle. The rubber soon gave way to tea and the main road below disappeared from our sight. 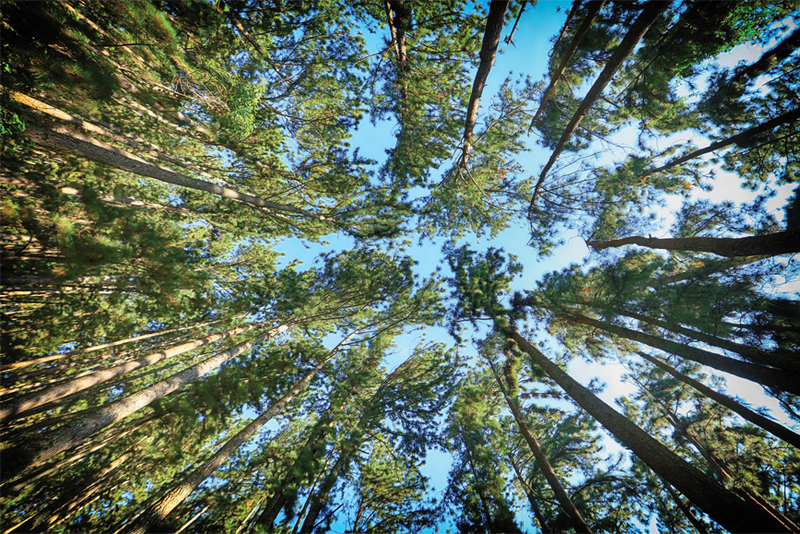 Often we had to get down on all fours to crawl up to the top! The water flowing over a jumble of rocks and splashing into a series of mini-waterfalls and pools was icy cold. Following the ravine upwards, we soon arrived at the abode of the pre-historic man. During excavations the skeletal remains of several human adults and a child were discovered. Dr P E P Deraniyagala named this prehistoric Sri Lankan as ‘Homo Sapiens Balangodensis' in 1955. In 1981, skeletons estimated to be 16,000 years old were also unearthed. According to carbon dating, the microlithic tools that were found during excavations were more than 30,000 years old. Kuruwita is a treasure trove of history and our next stop was Diva Guhawa, which is believed to be the place where the Buddha and 500 of his disciples spent the day after descending the sacred Sri Pada (Adam's Peak). According to legend, Diva Guhawa is the fifth site in the Solosmasthana, which consists of 16 sacred places in the island and believed to be hallowed by the visits of the Enlightened One and associated with Buddhism. 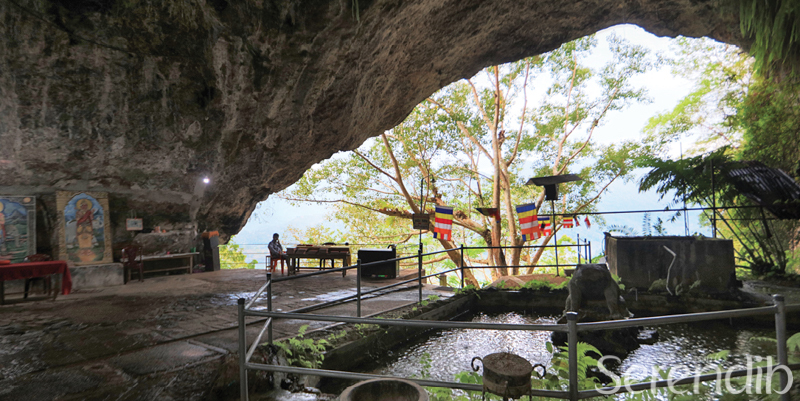 It is customary to toss a coin into the Manduka Pokuna dedicated to the Hindu God, Bahirawaya, which greets the devotees upon entering the cave. 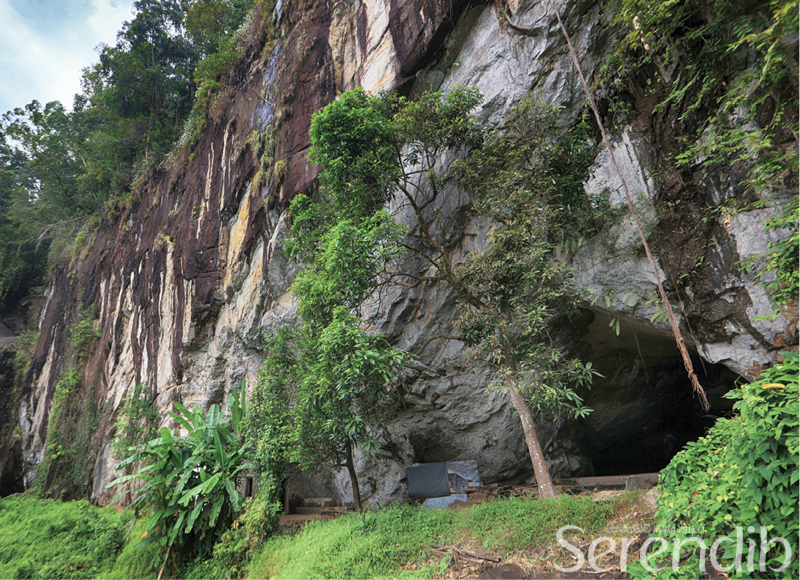 The inner walls of the cave are adorned with ancient paintings while a small shrine built on a rocky outcrop houses intricate statues of the Buddha in seated, standing and reclining postures. A dagoba and a bell tower stands in the corner facing the cave entrance. A striking panoramic view of the terrain and surrounding mountains including the square-shaped Kunudiya Parwathaya can be viewed from the cave entrance. Depending on the weather, one can also catch a glimpse of the silhouette of the Adam's Peak. We stood there for a long time revelling in the beauty of the canvas of nature unfolding in front of us, which presented the perfect conclusion for our journey. 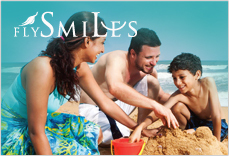 Kuruwita is an ideal destination for a day trip on a holiday in the beautiful island of Sri Lanka.